I love growing Zinnias in my garden. With their long straight stems they are a great flower to cut and put in bouquets. Zinnias are durable and can outlast other flowers in a bouquet. The more you cut them the more they grow. Zinnias can also handle our hot Utah summers. I planted a few different varieties in my garden this spring. I started the seeds indoors near a sunny window about the middle of April. I planted them in my cutting garden around May 15. This year I tried a new variety called Zinnia Envy. 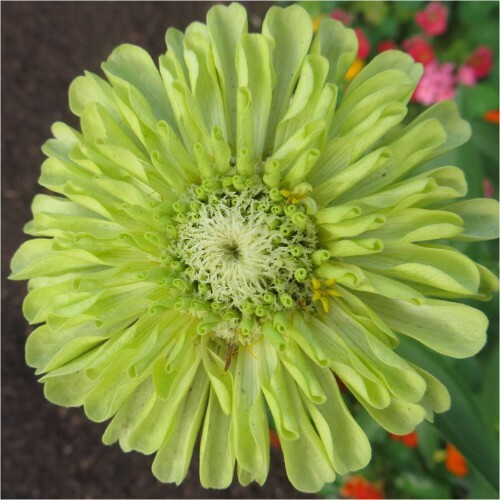 It’s a pretty lime green color and I think it steals the show in the garden and in any arrangement. 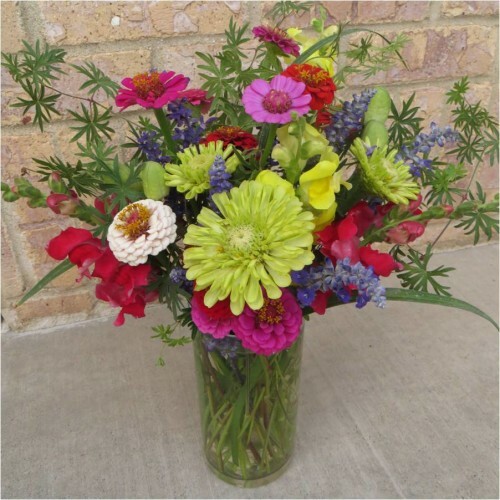 Zinnia Envy is the focal point in this bouquet with Zinnias, Salvia and Snapdragons. I used hardy Geranium leaves and Day Lily Leaves for filler. Zinnia Queen Red Lime Photo from Burpee Seed. Next year I plan to grow more Zinnias in my garden . I want to try Zinnia Queen Red Lime. I love the unique color combination and vintage look. Wouldn’t it look stunning combined with Zinnia Envy. This summer isn’t even over and I am already planning next year’s garden! Very pretty! 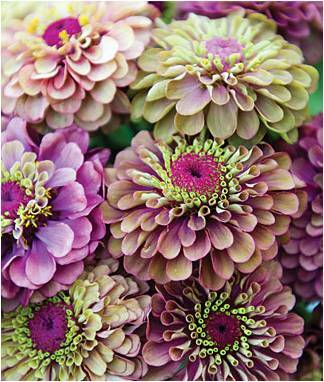 I will definitely put zinnia’s on my list for next year! Your bouquets are just gorgeous! Zinniias are such happy guys!! Lovely pictures. Your zinnias and bouquets are beautiful! I really do like the red lime too. I have to check that out for next year, too! Zinnias have become my favorite annual however I’ve never seen that beautiful green one. Ever since I discovered them I plant them every year in the front of my house. Thanks Tammy! The lime green one is gorgeous! I love zinnias too. I have a whole raised bed of them in my veggie garden. Zinnias are my favorite flower for cutting. I planted the green ones this year, but so far I haven’t seen any blooming. Mama used to grow Envy Zinnias and green Gladioli in her garden years ago. She used them to make bouquets for the church altar. Beautiful, that first one in chartreuse is a winner, love that color! That color combo of green and purple is gorgeous! They are two colors I have combined in my living room along with a natural wood. Very nice! I planted these lime green Zinnias this season too. Unfortunately I have only had two blossoms so it may be too hot for them here. Did you have a lot of luck with yours? I thought they were beautiful so I would love any tips you might have. Well, you have made a convert out of me: I’m definitely planting zinnias this coming spring!! If you think it’s hot in Utah, you can’t imagine what we get here on the island! I’ve been looking for a strong and ‘durable’ flower to withstand the wicked winds we get up here on the top of the hill! What a gorgeous bouquet of colour and texture and styling! Thanks for the inspiration!